Protecting, supporting and uniting Washington craft brewers through legislative advocacy, education and brewer community building. 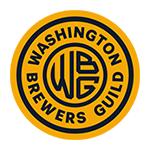 The Washington Brewers Guild is a non-profit organization dedicated to protecting and promoting the interests of WA craft brewers while strengthening the WA craft brewing community. We unite brewers from all over Washington State to advocate for laws and policies that will keep the craft beer industry thriving and ensure quality and choice for WA beer lovers. You can support us by joining as a member or attending Winter Beer Fest and Cask Beer Festival. Our members enjoy many benefits while supporting the WA craft beer community. We are fighting to protect WA craft brewers and ensure choice for WA beer lovers. Join us at our annual festivals, Winter Beer Fest and Cask Beer Festival!